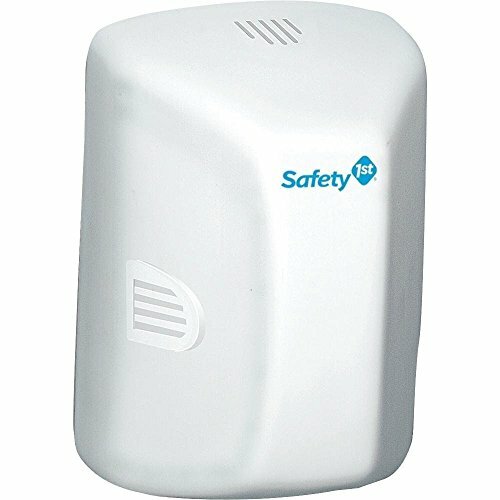 Make your home a safer place for your child to play in and explore with the Safety 1st Outlet Cover with Cord Shortener. 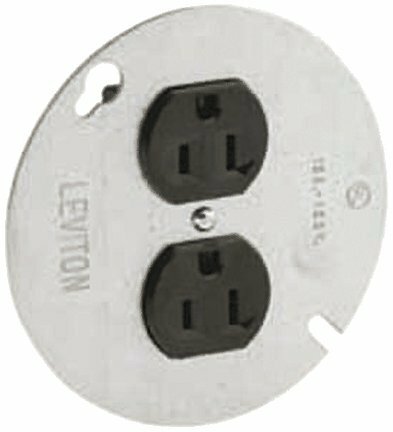 Help keep curious little hands away from potentially-dangerous electrical outlets with this outlet plug cover. Covering the entire outlet, the cover keeps excess appliance cords off the floor, storing up to four feet of cords, depending on thickness. Easily remove and replace the outer cover with the child-resistant dual-press operation by simply pressing both side tabs simultaneously, while gently pulling the cover away. 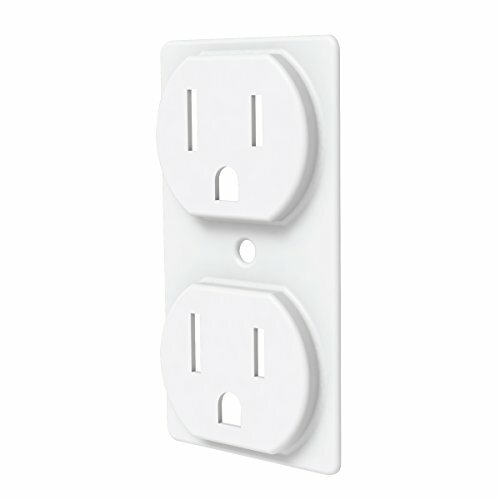 Along with appliances like lamps, televisions, and computers, the outlet cover works great with standard-size phone chargers, safely winding their cables out of sight. 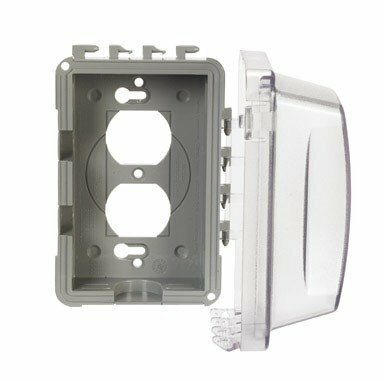 This kit includes one replacement wall plate and cover. A flat-head screwdriver is needed for installation. Remove the cover to clean, wiping it with a damp cloth and allowing it to dry. Safety 1st believes parenting should have fewer worries and more joyful moments, so you enjoy every first your child experiences. Note:Please refer to the user manual before use. 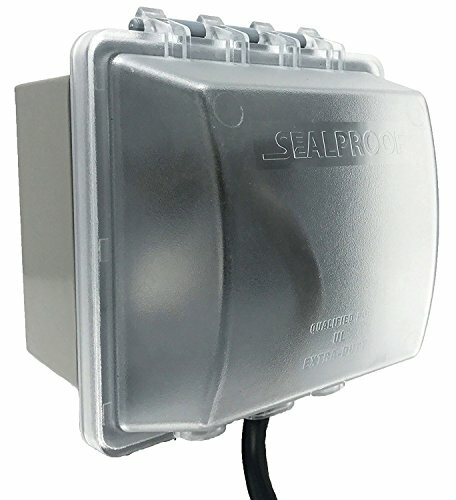 The Sealproof 2-Gang In Use Weatherproof Electrical Outlet Cover is UL Extra Duty Compliant with a patented multi-configuration design. 1 It is made of a Durable Polycarbonate Construction. Lockable, and easy to install, it is 3-1/4" deep and includes a gasket and mounting hardware. Gang Can be used horizontally or vertically, providing use perfect for up to 45 configurations, whether GFCI, Duplex, Switch or a Round Configuration of 1-1/4", 1-3/8", 1-9/16", 1-5/8", 1-11/16", or 2-1/8". NATIONAL ELECTRICAL CODE 2014 EDITION 406.9 Receptacles in Damp or Wet Locations (B) Wet Locations. (1) Receptacles of 15 and 20 Amperes in a Wet Location. 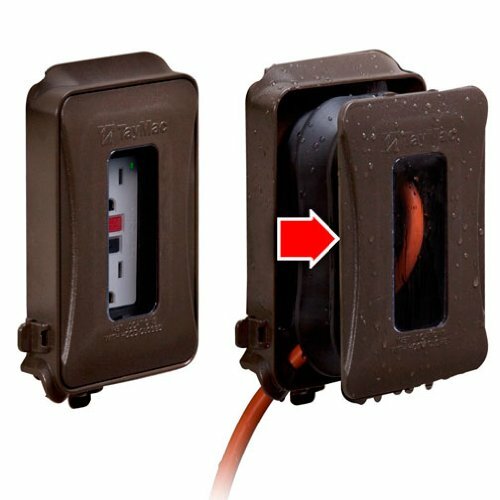 15- and 20-ampere, 125- and 250-volt receptacles installed in a wet location shall have an enclosure that is weatherproof whether or not the attachment plug cap is inserted. An outlet box hood installed for this purpose shall be listed and shall be identified as "extra-duty." All 15- and 20- ampere, 125- and 250-volt nonlocking-type receptacles shall be listed weather resistant type. Durable polycarbonate construction, Lockable and easy to install, includes gasket and mounting hardware, fits full size padlock. 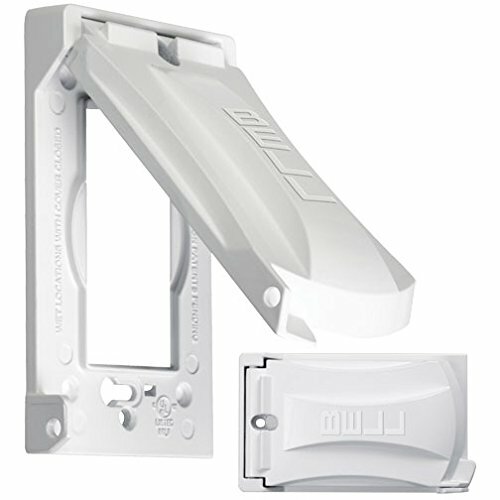 Taymac, clear, 1 gang in use, horizontal/vertical, 16 in 1, standard outlet cover, high impact polycarbonate construction provides maximum durability, patented quick fit keyhole mounting system allows installation in under a minute, includes attached gasket & mounting hardware, base configuration with patented knock out technology for custom fitting, lockable tab, UL listed, 2011 neck compliant article 406.8(B) (1), NEMA 3R compliant. One Device with Two Levels of Security! 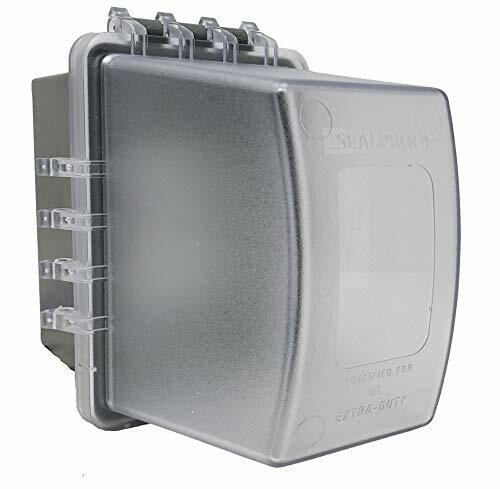 Switch Shield's brilliant design offers the perfect combination of varied, customizable access options in an attractive, non-intrusive, clear design that blends with any decor. Use the patented Switch Shield to control a switched circuit in the home, public place or on the job site. Switch Shield helps prevent accidental power interruptions to appliances, sensors, security lighting, switched wall outlets, furnaces, and more. And, they're great for switches that control Smart Bulbs too! 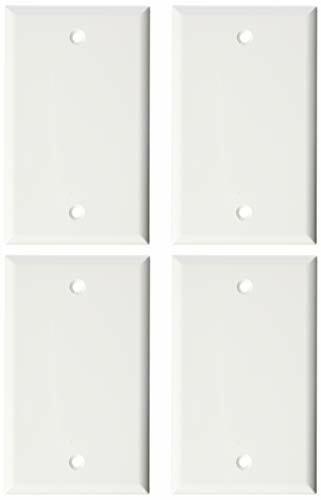 Or, use them to differentiate between seldom used and frequently used switches, such as ceiling fan or bathroom fan switches that are located right next to lighting switches. 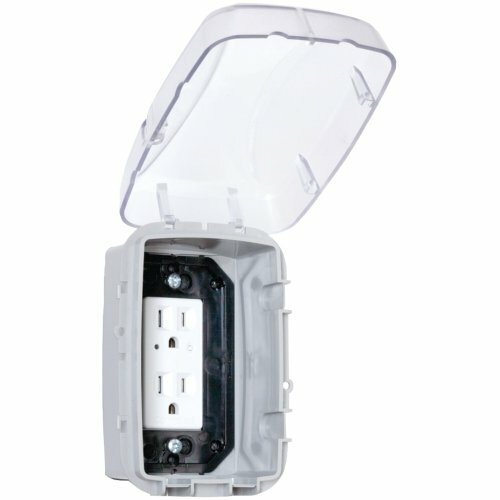 For maximum security, install right out of the package; a hole (the size of a pencil) allows for emergency access without removing the Switch Shield. For easy finger access, remove one or both of the tabs (before installation) and the Switch Shield functions as a gentle deterrent, allowing easy deliberate switch activation. Dimmer compatible too, with dimmer control access ports along the side and face. Switch Shield is the clear choice for switch protection! 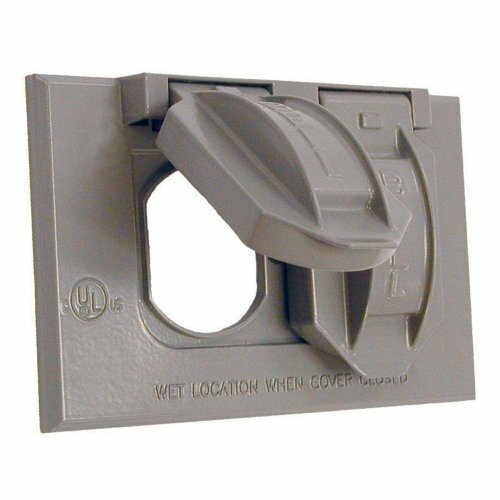 Installs easily with existing wall plate screws (In the rare event longer screws are needed, they may be purchased from your local home improvement store.) Money Back Guarantee. 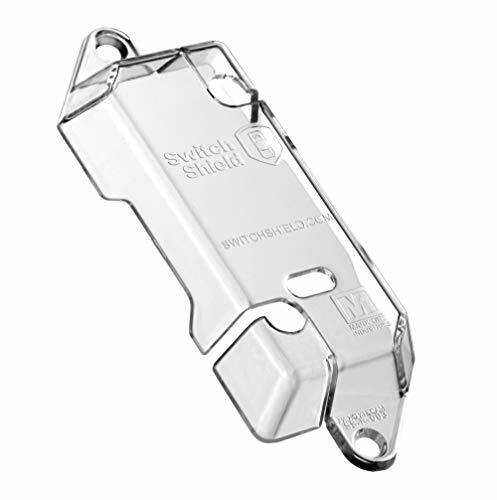 Brand: Switch Shield ON | Manufacturer: Mark One Industries Inc.
Can be used horizontally or vertically, is lockable and includes gasket and mounting hardware. Outlet box not included. 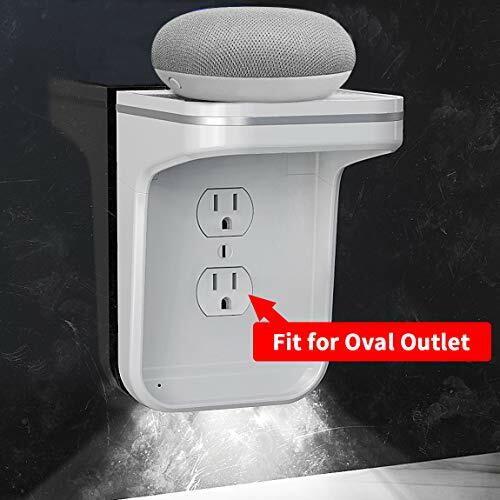 For total outlet protection, this childproofing aid covers an entire outlet with plugs and includes a built in cord shortener. The TayMac one-gang metal waterproof cover is made up of heavy duty, die-cast construction with a durable powder coat finish. It has technology with a patented universal fit adapter and a patented quick fit key hole mount installation that enables you to fit different size screws. This cover comes with a lockable tab and a spring hinge closure. The metal flat covers meet 2008 NEC standards for a horizontal or vertical mount. Warranty: TayMac guarantees every product sold for life. If any of our products fail from a manufacturers defect at any time during the life of the product we will replace it absolutely free. elago Nest Hello Case fits with your Nest Hello Ring Doorbell and has access to all functions without any interference. It protect your Nest Hello from UV light, weather elements, dust and scratches. DESIGN: Fits perfectly with your Nest Hello Ring Doorbell and has access to all functions without any interference - the case does not block the camera, microphone, speaker or night vision. Raco non-metallic gray cover floor box kit in designed to be used with RACO 5511 non-metallic concrete pour floor box. 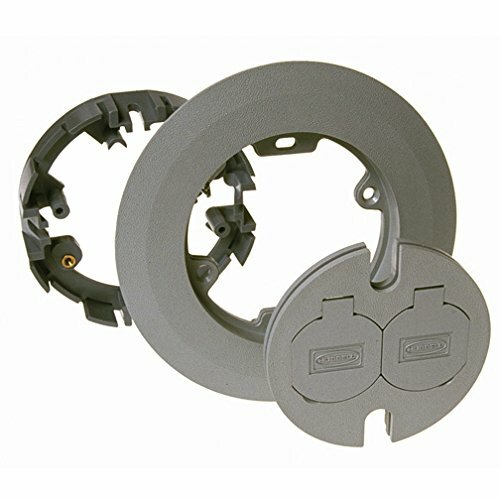 Kit includes non-metallic adapter (needed for us with 5511 floor box), gasket, gray carpet flange and gray duplex cover. Completes flush installation on carpeted flooring. 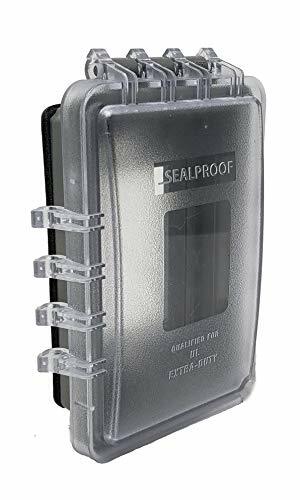 Hubbell Bell 5180-0 Single Gang Weatherproof Cover - Horizontal Duplex for use whenever weatherproof protection is required for an outdoor receptacle. Weatherproof Expandable Flat In-use device covers provide weatherproof protection to a single gang box. The covers provide in-use flexibility by expanding outwards to 3-1/2". Flat In-use covers are made from ultra rugged polycarbonate and synthetic neoprene rubber. An attached gasket, mounting hardware and installation instructions are included. CABLE MANAGEMENT Design a convenient cable channel and cord storage area under the power perch to hide the cord for a sleek look with no power cords hanging all over the place when charging your devices.